Once I have been asked for a suggestion besides visiting temples and shrines by a mother of cheerful boys. 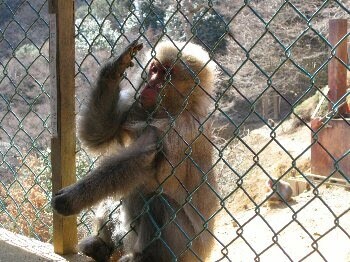 At that time, I picked up Monkey Park in Arashiyama. They were pleased to have this itenerary. Unfortunately, we had to give up visiting there due to the weather on that day. This year, I visited there with other tourists. 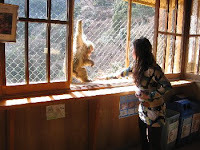 If you have enough time during your stay in Kyoto, if you want to visit anywhere else after visiting temples and shrines, and if you like animals, how about visiting Monkey Park? 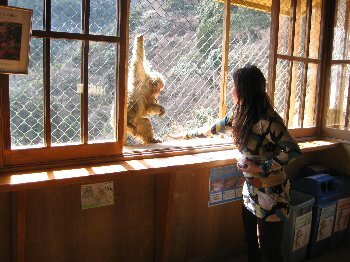 I didn't know Japanese Monkeys ( I don't know whether it is the proper way to call them) were special for visitors from abroad. However, the monkeys are to be seen in Asia, aren't they? You can see and feed wild monkeys there. After walking up the hill for a while, you will find some monkeys playing, sitting, walking here and there. If you want, you can get their food in the hut, and feed them from the inside of the hut. Inside?? Yes, from the inside! From the outside, the monkeys get food from you. At first it seems a reverse way, but it is actually safer. So feeding them outside is, of course, prohibited. Anyway, feeding is a lot of fun. Why don't you visit this Park ? Oh, one thing I have to say!! Please wear sneakers! The reason? You can know when you get there!! 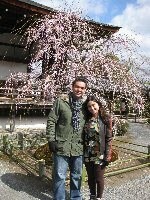 Tour : Tenryuji temple, Bamboo forest, Togetu bridge and walking riverside, Monkey park, Ryoanji temple, Kinkakuji temple ( Golden Pavillion.